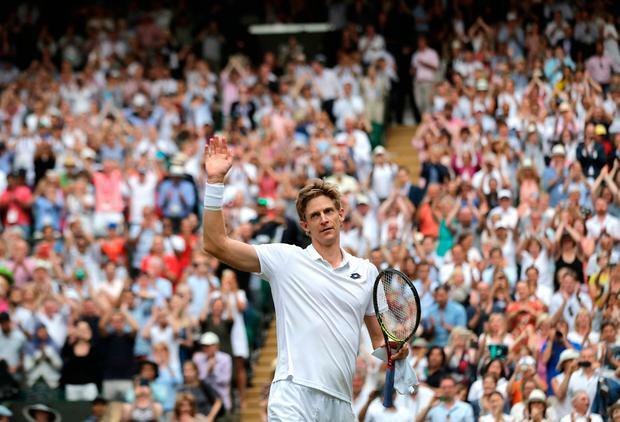 Kevin Anderson overcame marathon man John Isner to reach the Wimbledon final after the longest semi-final in grand slam history. Anderson, the eighth seed, won a gruelling battle of the big servers as records tumbled on Centre Court. The exhausted players embraced at the net after a classic encounter eventually finished 7-6 (8/6) 6-7 (5/7) 6-7 (9/11) 6-4 26-24 in South African Anderson's favour after six hours and 36 minutes. Isner will always be renowned at the All England Club for having won the longest grand slam match ever played, when he beat Nicolas Mahut on Court 18 in a first-round match lasting 11 hours and five minutes in 2010. That match spanned three days, while this one looked set to run all night at one stage, having begun shortly after 1pm. Isner, 33, stands 6ft 10in and come the final points he looked almost too weary to move for the ball. It was a severe test of stamina for both players, as well as those watching, and meant a long wait for Rafael Nadal and Novak Djokovic who were due on next in the second semi-final. The match was not pretty but it was enthralling, Isner leading by two sets to one after three tie-breaks before 32-year-old Anderson made a break of serve count to level up. Isner's 53 aces meant he beat Goran Ivanisevic's Wimbledon record haul - the Croatian sent down 213 in 2001 - but the 214th he served was his last of the tournament. Anderson weighed in with 49 aces to reach 172 so far. Anderson had won 13-11 in a decider to knock out defending champion Roger Federer in the quarter-finals, so he knew his way around a lengthy match as well. Occasionally there were outbreaks of tennis amid the thudding serves, with one 23-shot rally won by Anderson at 6-5 in the first set. After 6ft 8in Anderson edged the opening tie-break he eked out another break point in the second set, but once again Isner repelled it and this time the tie-break went the way of the American. The first two sets had taken just under two hours. Survival expert Bear Grylls, a guest in the Royal Box, was probably weighing up what materials were at hand to build a shelter for the night. Isner had, incredibly, not dropped serve once during the championships until, at the 111th time of asking, he was broken. Both players had set points on their own serve, and both were denied until Anderson scooped a forehand wide and Isner was ahead. The players exchanged breaks again at the beginning of the fourth set, before Anderson grabbed a crucial break at 4-4 and served out. Into the decider they went, and a grim treadmill of service holds persisted until, at 17-17 all, Anderson found himself with two break points, only for two aces to prolong proceedings. At 24-24, Isner was serving and visibly wilting. Anderson took a tumble but managed to get to his feet and hit a left-handed shot inside the baseline, taking the point for 0-30. He fashioned three break points from the next rally and took the second, the first break of the set. Anderson served for the match and it ended with Isner planting a forehand wide, the American's dream over.